Anstey, Leicester, England: F. A. Thorpe Ltd, 1992. 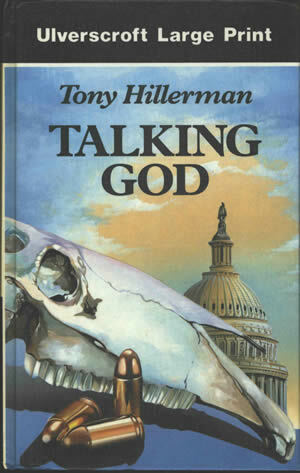 This is the first large print UK edition of Talking God, published by F. A. Thorpe Ltd, in Anstey, Leicestershire, in 1992. This is a hardcover book without a jacket. The cover is uncredited and features a composite drawing. Binding: Full-color vinyl-covered boards. On the spine, "LARGE PRINT" appears at the top in white on black; the book title and author name are in black on white; and the publisher's name and logo are at the bottom, in white on black.